When the time came this afternoon for Jim Thome‘s turn to be formally inducted into the Baseball Hall of Fame, it was no surprise to learn that it would his mentor, friend, and former manager Charlie Manuel who would be doing the introductions. By way of a pre-recorded video, the now 74-year-old former skipper heaped praise on the man whom he managed with both the Cleveland Indians and the Phillies. “Every time he walked up to the plate he was dangerous,” began Manuel. The two are both Phillies Wall of Famers. Now the pupil has surpassed the teacher and reached the pinnacle of individual achievement in his profession. Manuel went on to recall the circumstances when they first met, and the characteristics that attracted him to the young power hitter. "He hit so much, I don't think I can explain to you how much he hit." Manager Charlie Manuel reflects on the career of #MLBNetwork's own Jim Thome, ahead of his #HOFWKND speech. There has clearly always been a special bond between the two men. In Cleveland, Manuel was the hitting coach as the Indians won the AL Central Division crown in each of Thome’s first five full seasons from 1995-99. Manuel would become the manager of the Indians in 2000 but was fired in July of 2002 over a contract dispute. Thome would leave as a free agent that following off-season, signing with the Phillies. In 2005, the two men would experience an all-too-short reunion when Manuel was hired as the Phillies new skipper. However, Thome would suffer through an injury-marred first half. By June 30, his season was over. Into the breach would stop a new slugger, Ryan Howard, who would win the NL Rookie of the Year Award that season. Thome’s days in Philly were numbered. Following that 2005 campaign, Thome was traded to the Chicago White Sox for Aaron Rowand and two pitchers, one of whom would be Gio Gonzalez. Manuel would go on to guide the Phillies to five consecutive NL East crowns, back-to-back National League pennants, and the 2008 World Series championship. Thome then pointed a finger at Manuel adding “But most of all, thank you for your loyalty.” The skipper returned the gesture with a nod, clearly emotional behind dark black sunglasses. After Thome had recounted his days in Cleveland, he quickly moved to his time in Philadelphia. Thome also gave a special shout out to former Phillies trainer Jeff Cooper for a program that helped Thome manage a recurring back problem. 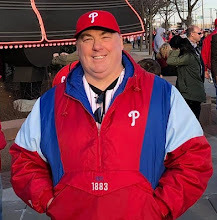 There was a large contingent of Phillies fans on hand in the crowd, an acknowledgment that his affection for the City of Brotherly Love is fully reciprocated. Jim Thome is a class act, and he demonstrated that again today at Cooperstown. His special relationship with both Manuel and the Phillies organization was on full display as he joined the pantheon of the game’s greats.